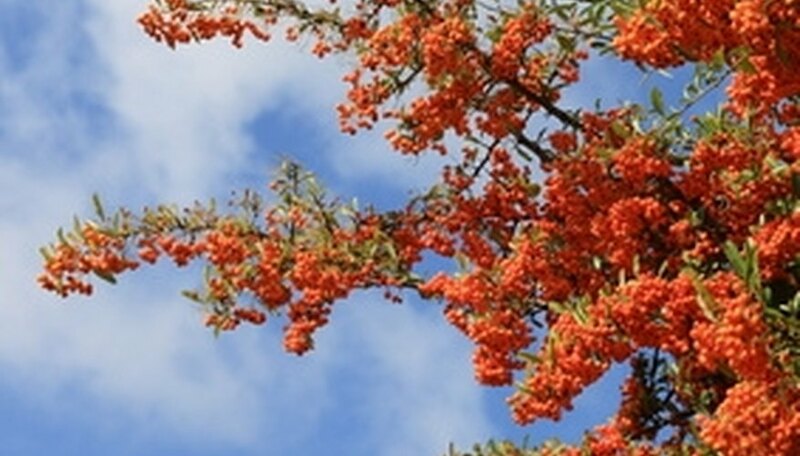 The pyracantha shrub is scientifically known as Pyracantha coccinea and also called the scarlet firethorn bush. This shrub exhibits shiny dark green leaves, delicate white flowers in the spring, and vivid orange-red berries that ripen in late summer and persist through winter, adding a blaze of color to wintry landscapes. This fast-growing evergreen shrub--which can reach 15 feet tall--excels not only as a single specimen planting, but in borders and hedges; it can also be trained to ramble over archways and along fences. You can prune your pyracantha to promote an attractive shape and increased vigor, but be aware that pyracantha, a member of the rose family, features abundant thorns. To avoid injury, use caution and wear protective clothing while pruning it. Put on high-quality, heavy gardening gloves to guard against the thorns of the pyracantha shrub, and wear long-sleeved shirts and long pants in a fabric that is heavy enough to protect your skin. Wear protective goggles to prevent eye injury. Remove the ends of green shoots on your pyracantha in late spring or summer to control excessive, straggly growth, promote side branching and reduce the need for more drastic pruning later on. Be on the lookout for new growth that could hide the attractive berries in the winter, and remove it. Trim your pyracantha for shape during spring or summer, using the technique of "heading back"--cutting back the ends of woody branches to a healthy branch or bud. By choosing to cut to a bud that is either inward or outward-growing, you can influence the shape of the pyracantha shrub. Use pruning shears, loppers or a pruning saw in late winter or early spring to thin your pyracantha and open the shrub up to increased sunlight and air circulation. Cut selected branches one of three ways, using your discretion: cut them at the point of origin from the parent stem, cut them to a lateral side branch, or cut them at ground level. According to the North Carolina State University Horticultural Extension website, a good rule of thumb when pruning to a lateral branch is to prune to a lateral that is one-third the diameter of the branch being removed. Leave some older growth on, so you don't sacrifice all the colorful berries and flowers, which are produced only on growth that is at least a year old. Prune at any time of year to eliminate dead, diseased or damaged branches on your pyracantha shrub, sterilizing the blades of the pruning shears between every cut to avoid making the shrub more vulnerable to insect pests and diseases. Dip the blades of the pruning shears in a disinfectant made by mixing one part chlorine bleach to nine parts water. Seventy percent wood alcohol is also a good choice for a disinfectant solution. Perform a rejuvenation pruning when your pyracantha begins to get too large for its location. Do this drastic pruning only in late winter or very early spring, before new growth begins. Cut the shrub back to bare branches 4 feet from the ground. It should recover, featuring dense and healthy growth, within two years.